I went shopping with a very specific need – espresso coffee to be used in an espresso machine. I was totally willing to order it from an online resource but my shopping buddy convinced me if it were to be had, her preferred store would have it. We maneuvered our way through ground coffees for conventional coffee makers, instant coffees and then on to the “cup” category. The options to choose from were too many to count, and the thought of trying to figure out the unique differences between the varying brand offerings was simply overwhelming. In the end, I was unable to find my desired espresso but I did find myself standing in front of Wide Awake Coffee. I was surprised at how my eye kept coming back to their packaging over all the other product offerings. 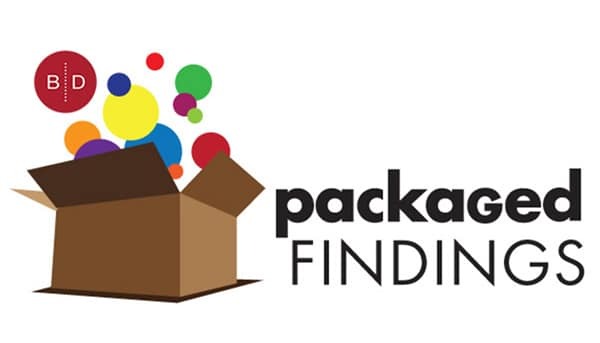 The package graphics, though not very refined, were simple, fun, and most of all, direct and easy to understand. 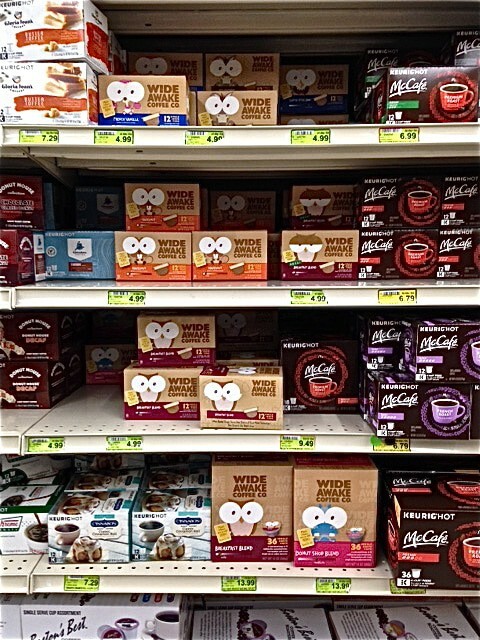 The use of highly stylized animal characterizations with wide open coffee bean eyes led me to believe that the coffee would be strong enough to keep users awake, and the packages all featured a reference to the design of the pod itself – a unique mesh lower portion as opposed to a rigid cup used in most K-Cup pod designs. All in all, the message the package sent out loud and clear was that brewing and drinking coffee was fun, which was enough for me to throw a package into the cart even though I didn’t need regular coffee. 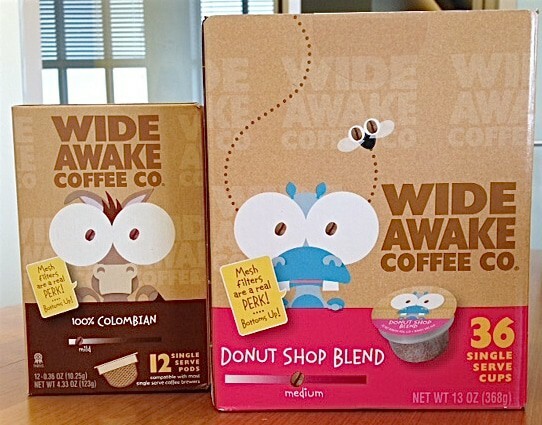 In a category of packaging filled with swirls, images of steaming cups of coffee, snacks, pod icons, violators and more, this was a straightforward brand expression that communicated its key product benefit – if it tastes good and “wakes you up”, it does the job – voilà, Wide Awake Coffee. Available in a variety of flavors, the overall coffee color background of each package accented colors in a variant band, furthered by a different animal that related in some way to the source or strength of the blend. Minimal tongue in cheek copy adapted to the design approach; and, packaging components were tied together, reinforcing the fun, lighthearted approach to brewing a cup of coffee. One of the things I appreciate about the package graphics is that no matter how you orient a package on the shelf, the design structure remains clear, consistent and direct. Information is consistently organized and uniformly placed on package panels, and when placed together on the store shelf, creates a very impactful billboard effect. A simple coffee bean slider bar quickly and effectively indicates the strength of the coffee blend in a given package. And for those looking for decaf blends, look for the animal to have their eyes half closed – a very cute approach to communicating no/less caffeine. If there is anything that is inconsistent with the various package sizes, it is the treatment of the mesh pod image. On the small (12) count packages the pod is represented in a profile view as a line illustration, making the configuration of the cup/pod extremely clear. On the larger package, the image is represented in a photograph shot from a perspective that does not offer the same degree of clarity in communication. It seems to me that as a proprietary feature of this product, it would benefit from consistent representation in all applications. It takes a great deal of restraint to create a package that relies on a few basic key images and messages to engage with the consumer. Wide Awake Coffee cuts through the shelf clutter, is universally understandable and puts a product that has been with mankind since the day someone dared try a coffee bean into a positive, contemporary light.